The artistic methodology in a medium follows an idea as befitting current trends here in contemporary Sri Lanka, as we delve further into a world governed by ever-changing laws of digitalisation. Modern life is determined by a dominant reliance on social media and the technological ease of access to convenience, and is given often at a price. It could be said that the role of the artist-designer and innovator today would be to navigate the nuances and overlapping realms of the different types of technology that provide for the beneficial and consequently disturbing aspects of our lives. ANUK X MUVINDU is a collaboration between the fields of art and design that utilise reliance on both the physical and digital aspects of everyday life. Muvindu Binoy draws inspiration from our population’s use of the internet, the varied types of digital cultures and associative neuroses of personality inhibitions; Samaadhi Weerasinghe in turn applies these critical reflections onto a clothing brand that takes the prestige of art from the pristine walls of the white cube gallery space and moves it out onto the everyday street. Social critique could now be described as being made ready-to-wear and may be taken across the globe as a revamped proponent of contemporary street art of Sri Lanka. 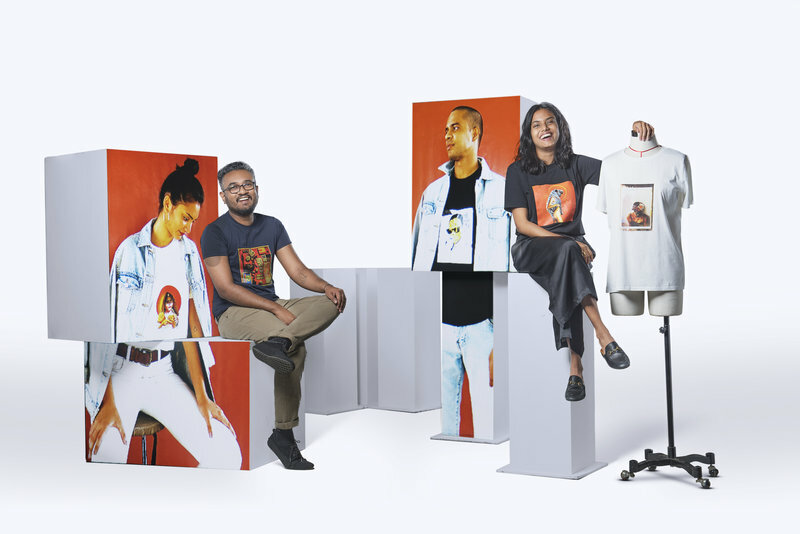 Samaadhi and Muvindu decided to collaboratively strike out after former, an established fashion designer exclusively retailing at fashion-design house PR, discovered Muvindu through online site Artspace Sri Lanka, a filmmaker and graphic artist represented by Saskia Fernando Gallery. Muvindu operates from a non-academic background, having started off making music videos and visual graphics following stints at branding and commercial advertising agencies. Samaadhi and her homegrown brand ANUK, named after her brother, currently works in the garment industry and chases her passion for filling in and highlighting spaces that she believes could be more developed, especially amongst the younger generations of aspiring designers and urban-culture enthusiasts.